Applications to establish a new club in the US city of New York and relocate Hemel Stags are being considered by the Rugby Football League board. The board, which has previously granted a licence to Canada-based Toronto Wolfpack, believes the proposals will "help deliver the RFL's vision". Hemel withdrew from League One last year, but retained an RFL licence. And it has been confirmed that the club's holding company has been taken over by a Canadian consortium. However, community club Hemel ARFLC remains unaffected by the change in ownership, nor does the lease on their Pennine Way ground. 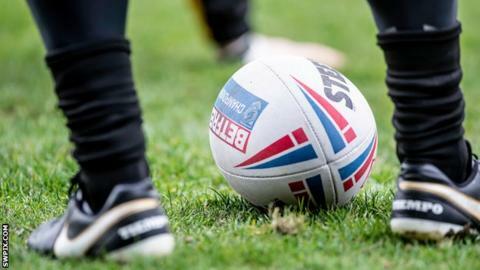 An RFL statement said the New York and Hemel applications were "at different stages, but a degree of further due diligence and assessment is required on both to ensure that the financial and business plans presented are deliverable". New York consortium representative Ricky Wilby said: ""We're grateful to the board of the RFL for considering our application and thankful it is deemed strong enough to present to the clubs. Members of the consortium will be asked to present their case to the existing Championship and League One clubs, from which the RFL will assess the level of interest. Toronto's introduction into the game's structure broke new ground for rugby league, which already had a continental horizon with French clubs Catalans Dragons and Toulouse included. Under the terms of their place in the league, the Wolfpack do not qualify for central funding, so owner David Argyle is wholly responsible for financing the venture, including covering travel costs for member clubs. Rugby league already has a place in the American sports landscape, with teams in Boston, Jacksonville, Brooklyn and New York itself. Eric Perez, the man who was behind the creation of the Toronto Wolfpack, is believed to be behind the bid to relocate League 1 side Hemel Stags. He has previously suggested either Hamilton in Canada or Boston, USA, as possible locations. The New York bid comes from a separate consortium and has been in the ether for over 12 months but both still have a lot of hurdles to clear. Not only will their financial and business plans be rigorously tested, they will also have to convince the current League One and Championship sides that they have something to bring to the pot. Both will inevitably see Super League as the ultimate goal - but there is currently a huge question mark hanging over the Super League clubs' appetite for this kind of overseas expansion.